... and that would be the full length of the Colorado River through the Grand Canyon! May 17 – May 24th. Launched at Lees Ferry and disembarked at Pearce Ferry. Just look at the colors in the water! The light in the canyon is beautiful. 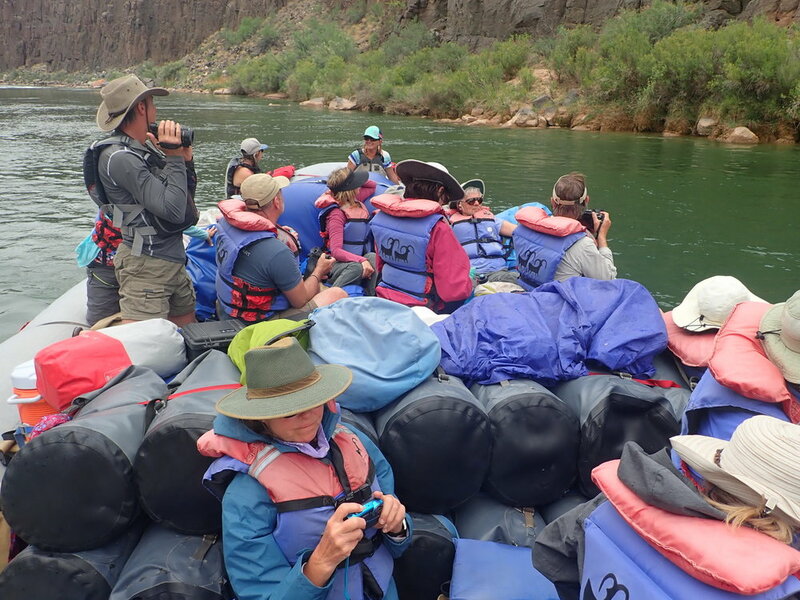 The reflections in the already gorgeous and surprisingly GREEN water of the river was stunning and oranges, pinks and bright blue seemed just as at home on the emerald green river as they did on the canyon walls and bright blue sky of Arizona. Each day we'd wake at 5:15, disassemble our cots (yes! we slept under the stars!) and pack up our sleeping bags and by 5:30 we'd hear this sweet melody from our lead guide Den... "HHHHHHHHOT COFFEEEEEEEE!" Coffee-in-thermos-in-hand we'd each head back to our sleep spot to pack up our clothes and sundry items in day bags and ammo cans. The light first thing in the morning on the river is beautiful and the day isn't yet super hot so for painters this is the magic time. As the guides made breakfast and started packing items back onto the boat, we would paint/draw/write. In total, we were 2 guides and 12 painters of different media (watercolor, oil, pastel) and a writer. Artists pack A LOT OF STUFF! The beige dry bags are just our clothes. We also had blue bags with sleeping bags/pads and a tarp. Hannah (left) our Swamper (aka guide in training) and Den our master River Guide! A boatload of artists.... and GEAR!